Want to have a perfect media player that fulfills more than your entertainment needs? The Cyberlink PowerDVD 13 Ultra is a universal player used for any media playback, view photos on a computer, YouTube or Facebook or other devices. It is a complete media player with truly innovative features such as “TrueTheater” enrichments, well-dressed media browsing and customizable playback options and tools. Cyberlink PowerDVD 13 is available in three different editions like PowerDVD 13 Deluxe (DVD only), Pro (Blu-ray playback) and Ultra (Blu-ray 3D playback) on Windows 8, 7, Vista and XP platforms. Each one will have its own set of unique features but it is strongly recommended to try PowerDVD 13 Ultra which has a complete bunch of basic and advanced tools. The current post will discuss about PowerDVD 13 Ultra. The latest version 13 Ultra has many advanced multimedia tools such as Bluray-Live Bypass, AVCHD 2.0 1080p/3D support, a dedicated Movie Library, Multiple Customizable Subtitles, 7.1 channel support and many more. The setup process takes 360 MB of hard disk space, completes within 2 minutes. Once the installation is completed, it creates “My Videos” and “My Pictures” folders like many media players, for the appropriate arrangement of all media files on your PC. It can also be installed on Smartphones, Tablets and other digital devices available in the market. Coming to the interface, PowerDVD 13 Ultra has very rich and high-quality look and feel, which no other player has. The interface has all important tools placed on left-side such as browsing Movie Library, My Computer, Removable and Remote Devices, Online Store, Home Media (DLNA), Online Media, and Playlists. At the bottom, it offers playback buttons such as Play, Sound, Zoom, TrueTheater, 3D, Settings, etc. You can customize the playback like changing the primary and secondary subtitles, aspect ratio, etc. whenever you wish to. Since 1998, Cyberlink has been providing excellent quality of media playback and is one of the oldest media players available. Cyberlink PowerDVD is the first Blu-ray 3D media player to achieve “Blu-ray Disc Association (BDA)” certification under the new Blu-ray 3D standard. With unique and advanced TrueTheater enhancements, you can get smoother motion, engross surround sound effects and sharper quality than ever. The TrueTheater add-ons include HD, Motion, 3D, Lighting, Stretch, Stabilizer, Denoise, and Surround. 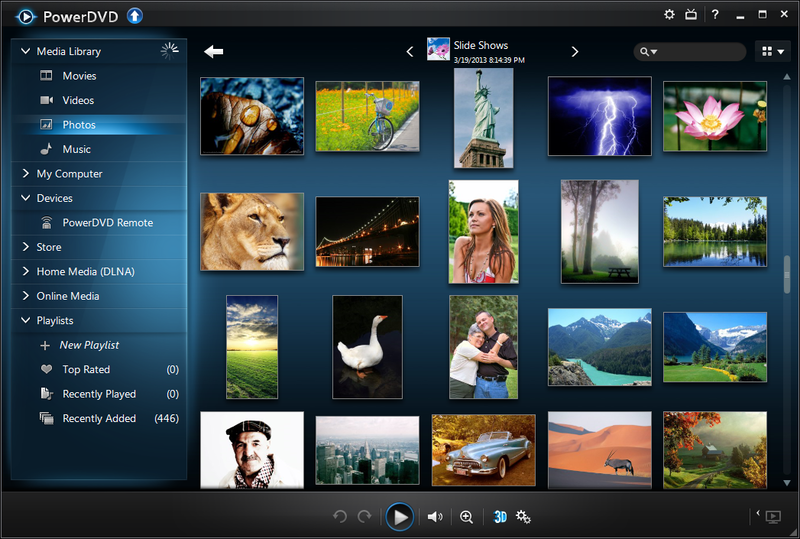 You can instantly convert movies and slideshows with stunning 3D effects. The available TrueTheater HD playback supports formats like DVD, Bluray Disc, MKV, YouTube and MP4. The product offers better-than-original quality which makes your favorite movies come alive. You can play or view all your media files which include movies, music, video clips and photos from your PC, YouTube, Facebook and connected devices. Play all 2D and 3D Blu-ray discs, MKV movies, Ultra HD 4K resolution videos, AVCHD Progressive, AVCHD 3D, Dolby TrueHD, Dolby Digital Plus, DTS-HD Master Audio, MP3 files, FLAC and other admired formats. You can view normal and Camera RAW photos slideshows with Pan and Zoom. You can also watch online content from YouTube, Facebook and Flickr. PowerDVD 13 Ultra provides “Instant Play” features which get you experience 50% faster start-up with its BD-Live Bypass technology. The “Instant Play” includes Instant Preview, Zoom, Scale, View, and Seek. You can quickly find content within your library using ‘Smart Search’ utility. It provides perceptive controls which make it different from other media players. With New Play Speed Navigator, you can easily set slow/fast motion playback, and instantly hide interface controls. It displays current time, estimated end time, and battery meter in full screen. Experience the best audio available with PowerDVD 13 Ultra’s lossless stereo formats and high quality surround sound. The latest version offers powerful ‘Home Theater Audio Technologies’ for Blu-ray and HD movies with DTS and Dolby Digital 5.1/7.1 channel soundtracks. You can acknowledge maximum quality music and Enhanced TrueTheater Surround sound. You can connect external audio components like Home Theater which transfers multi-channel high-definition audio using HDMI 1.4 cable. You can display primary & secondary subtitles simultaneously for Blu-ray disc, MKV, and MP4 movies with Patented Cyberlink technology. For MKV movies, you can edit subtitle size, color, border color and position. You can display subtitles in a separate letterbox region or even load subtitles by drag and drop files. It is easier now to organize all your media files such that you can browse movies, music, video and playlists at one place. Find your media by folder, album, artist or genre. Get information about Online Movie Content, Create/Manage playlists, Smartphone & Tablet Sync, Browse Network Devices via DLNA, Link to Social Media Accounts, and Purchase Music via 7digital online music store. You can stream and share all your movies, photos, and music with TrueTheater quality between Windows, Android, iOS and DNLA devices. You can link all your devices with PowerDVD Mobile and Remote that allows you to stream, sync and share content across many platforms, such that you can experience unlimited entertainment anytime, anywhere. It intelligently converts and sync videos, photos and music for your Android, Blackberry or Tablet devices. As Windows 8 OS has advanced specifications, you can experience complete media entertainment with 2D/3D Blu-ray, AVCHD 2.0 and TrueTheater HD media playback. For Blu-ray Disc: Intel Core2 Duo 4500 @ 2.20GHz Processor or above and 2GB RAM. For Blu-ray 3D and TrueTheater HD/3D playback: Intel Core i5, AMD Phenom II X4 or above. DVD Playback: Pentium 4 (2.4 Ghz), Athlon 64 2800+ (1.8 Ghz), AMD Fusion E-series & C-series or above. 4K UltraHD with Hardware Acceleration: Intel 3rd Gen Core i5 or above. Hard Disk Space: 400 MB Product Installation. Operating System: Windows 8, 7, Vista and XP Service Pack 3.